The Royal Baby boy was on the way as Prince Charles visited the National Railway Museum in York. 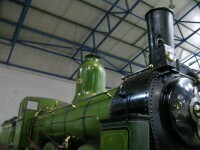 The NRM makes for a wonderful day out for everyone and is just round the corner from the station. The first ever Traverse conference was a roaring success. Expertly put together, it featured things bloggers actually want to know as well as food, drink and free massages. The location, Brighton has the added bonus of the Volks Railway, the oldest electric railway in the world. I made some calculations recently to see if being on a perpetual package holiday would cost less than living in London. I was surprised to find that it actually might. As a freelance writer, the cost of living in London is just too high when you’re starting out. In November 2012 I lost my trumpet. Unable to sell myself to the point where I was making enough money to get by, and drowning in a sea of SEO copywriting, I wanted to do something. Naturally, I fled to India with the last of the money I had. The British government scrapped a rather expensive deal which would have seen Virgin looking after the West Coast Mainline rather than FirstGroup. The Department for Transport's not-too-friendly history with Virgin made me think perhaps breaking the deal was part of a larger conspiracy. Everyone loves a conspiracy. Social Media Week is interesting because it is for all kinds of people who work online in different industries. It gives people like me, who can usually be found lingering in the travel space, the opportunity to hang out with the non-for-profit crowd and contribute as best I can. Ever visited anywhere faintly morbid? A cemetery, a site where genocide has taken place, a battlefield? If so, you might be considered a Dark Tourist by the iDTR, a research project on Dark Tourism that now offers an MA in the subject. I went to interview Professor Richard Sharpley. On this trip to Brighton I stood by the Volks Electric Railway, an actual train, and walked in the Pride procession. You could call the Pride procession the Pride Train. You know, if you wanted to. In the spirit of Pride I wore pink and had fun.